Manchester City and Liverpool continued their brilliant start to the 2018/19 Premier League season with convincing victories away to West Ham and Watford respectively. There were also wins for Arsenal and Everton but Manchester United could only draw at home to Crystal Palace. In the biggest game of matchday 13, Chelsea suffered their first loss of the season, going down 3-1 away to Tottenham Hotspurs. At the wrong side of the table, only three sides registered victories. Huddersfield, Newcastle and Fulham all getting vital three points in their quest to fend off relegation fears. Here are the 11 players that stood out for me in game week 13 in a 4:5:1 formation. Hennessey made five saves as his Palace side registered a vital point away to Man United on Saturday. His stop to deny Romelu Lukaku late in the game was as good as they get. Alexander-Arnold continues to impress week in and out and against Watford, had a decent day out including a superb curling free-kick to make it 2-0 in the second half. For Palace to earn anything at Old Trafford, their back line had to stand firm and it is what they did. I was more impressed by their Frenchman Mamadou Sakho who produced arguably his most stand out performance in the 0-0 draw on Saturday. Sakho led the back line like the experienced lad he is. Calm in possession and strong in the tackle he was all afternoon. CB. Jonny Evans (Leicester City). Replacing Harry Maguire in Leicester’s back line is no easy fate especially after all the performances the big Englishman puts in week in and out but on Saturday, despite playing with 10 men for most of the game, Evans was not fazed by the pressure as he helped his side scrap out an unlikely draw away to Brighton. Kolasinac assisted Aubamenyung’s winner in the 2-1 victory over Bournemouth on Sunday. He may not be the classiest of left backs but one who clearly gets the job done like he did on matchday 13. Unfortunate to be on the losing end, Armstrong scored twice for the first time in his premier league career as Southampton lost 3-2 away to Fulham. MF. Aaron Mooy (Huddersfield Town). Mooy scored twice as Huddersfiled defeated Wolves 2-0 at the Molinuex on Sunday afternoon. His brace was the first time any Huddersfield Town player had scored more than one goal in the same Premier League match since he himself did so against Watford back in December 2017. Everton did it the hard win to defeat lowly Cardiff 1-0 at Goodison Park on Saturday. Despite it not being his finest showing, Sigurdsson was the hero on the day, scoring the winner 11 minutes into the second half. MF. Leroy Sane (Manchester City). Sane scored twice and assisted one of the other two goals as City defeated West Ham 4-0 on Saturday afternoon. MF. Dele Ali (Tottenham Hotspurs). 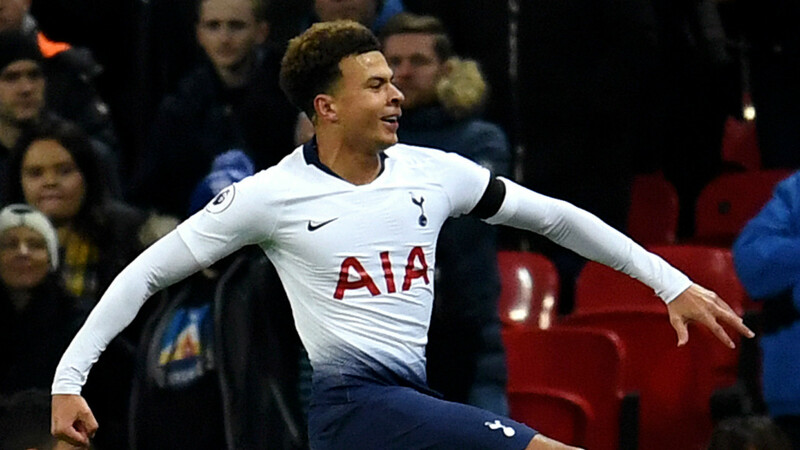 Ali scored the openner in Spurs’ 3-1 victory over London rivals Chelsea on Saturday night. He has scored more goals against Chelsea in all competitions than he has against any other side (6). Mitrovic scored twice as Fulham overcame Southampton 3-2 at Craven Cottage in Claudio Ranieri’s first game in Charge. He has scored more headed goals than any other Premier League player this season (4).